Are you an avid gamer? Do your friends often ask you for suggestions on how to crack the top levels on popular games? Would you love to flaunt your amazing in-game wins and accomplishments before the world? Well, then, it’s best to record your gameplay when you will play next and then upload it online for the world to see. Your recordings will also help your friends to understand your winning gameplay so that they too can accomplish such amazing wins during their gaming sessions. But, how to record gameplay? Well, you will need to get a gameplay recording software here which you will install in your desktop. The software will run in the background and as you will start to play, the software will begin to capture your entire gameplay. Gecata by internationally renowned software developer Movavi is a great option here. The software allows users to record gameplay at up till 60 fps and also enables to add webcam footage. The post below offers step by step instructions on how to record your gameplay with a gameplay record software. The first step is to download & install your chosen gameplay record software in your system. You will get installation instructions. Before you start the recording, you will have to adjust the recording settings to ensure the right frame. 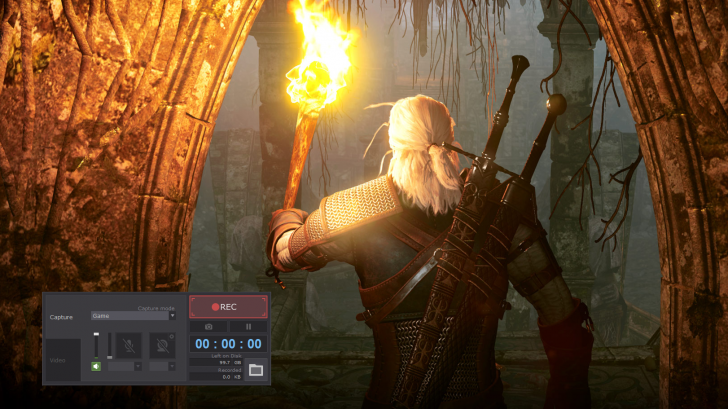 Your gameplay recording program will have a tab called “Capture”. Click on it. It’s to note here, these recording programs are able to capture a lot of things, like desktop audio or streaming online video- added to game sessions. So, before you start to record, you have to set your Capture mode to “Game”. Look for the same and click on it. Do you want to record the ambient noise and visual while you capture the gameplay. You may want to record your facial expressions at the most exciting peaks of the game to make the whole thing more realistic. In that case, you will look for “Webcam” and “Microphone” options on the program window. Do you want the webcam footage and microphone recording to come in separate files? Don’t worry, the best gameplay record software always has tools for all such nuances. Click on “Settings” tab and look for a tab that says something like “Capture Separate streams”. Click on it and go to “Webcam” tab. You will be able to customize the webcam record parameters here. Before you record, you have to decide on the video quality and resolution of your output video. Go to “Resolution” list and click on it. Do you want the recording to have the exact resolution of actual game video, click on “Original”. If not, you can select a different range of resolution from the enlisted preset sizes. Now, you will select Frame rate. Remember, higher frame rate means bigger file size. So, choose your frame rate accordingly. You will get to choose from a range of 15-60 fps. You will find a slider named “Video quality”. Click on that to adjust video quality of your output video. Look for the “REC” tab and click on it. Then, simply start your game. If you don’t want to record the game from the beginning, you can start the recording after you begin to play the game. You will be able to pause the game if you have to take a break for a while. After the recording is finished, click on “Stop” tab to complete the process. Then press on “Save” tab to save the game in the program library.